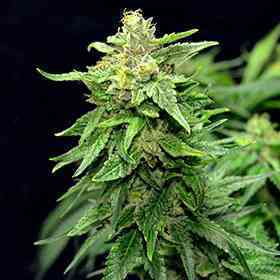 Very promising strain which can easily take the place of current bestsellers. Blue Cindy from G13 Labs Seeds is a perfect combination of Sativa and Indica genes - Sativa dominant plant with Indica growth pattern. Stable, powerful, quick and extremely tasty variety. This amazing lady has some crispy flavour with hints of pineapple and black forest fruits. Exhalation will reveal combined smell of citruses and pine. Cross of a Cinderella 99 and Blueberry produces massive and filled with resin buds fully covered with beautiful trichomes. Long lasting effect is truly euphoric and leads into psychedelic high. Perfect for day time use, evening with friends or chilling in the garden. Perfect perfection.